Have Amputees Gone Mad or Mainstream? It seems like amputees, and their legs were coming at me fairly regularly, at home and at the library this week. I wondered how much and how often amputees are in the media. So, I put them to a test. How many new amputee references can I catalog in a week? 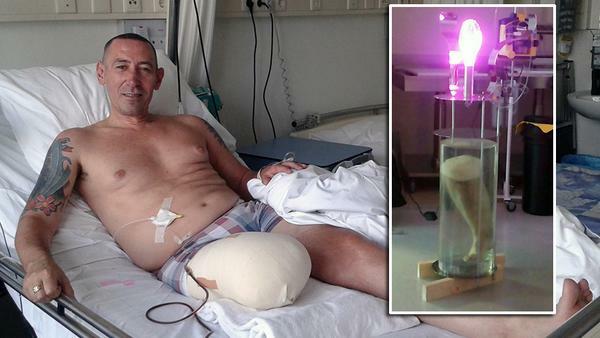 After having the leg amputated, the man had help from a pathologist and a lamp maker. He said Bonten could not “say goodbye,” to his leg, so he preserved it. Mr. Bonten put the leg lamp up for sale on Ebay for $127,500. Ebay took it down the same day saying it does not sell body parts. Bonten claims he had to sell it because he’s broke. “Soon I won’t even have a home where I can put the lamp,” Bonten said. I guess an amputee can’t even cash in when he’s able to upcycle his own leg from medical waste to a practical home furnishing project. I just want to know what bulb fits in the socket. LED, compact fluorescent, or incandescent? On Saturday night, I was using Amazon Prime Music, an app that lets subscribers stream from millions of songs in about 15 different genres and from other Prime member playlists. I flicked across the Dropkick Murphys, an American Celtic punk band. You’ve got to hear their song, “I’m Shipping Up to Boston.” The main character is a sailor without a leg, and he’s “shipping” up to Boston to get his peg. As I sorted the Press-Register on Sunday morning, a pair of brown eyes glanced up at me from the cover of Parade magazine. I was greeted by a German Shephard mix dog missing a left front leg. Mama Lucca was an IED detecting dog who saved the lives of 14 men, and was awarded an honorary Purple Heart for her actions. Her record of keeping our service members safe and without casualties still stands, but it came at a price. She’s now retired and living in sunny southern California. I was talking to a co-worker during lunch. Gwen asked if I’d seen the woman on crutches this morning. “I thought she might be coming in to talk to you,” Gwen said. I have met many amputees in the library and often go and introduce myself and let them know I’m an amputee too. The woman was was an above knee amputee. She was not wearing a prosthesis. “No,” I told Gwen, “I was helping another patron, so I didn’t have a chance to talk to her.” I saw her only briefly when she was checking something out at the circulation desk. After lunch, Cheryl told me she saw the movie Dolphin Tale 2 with her granddaughter. 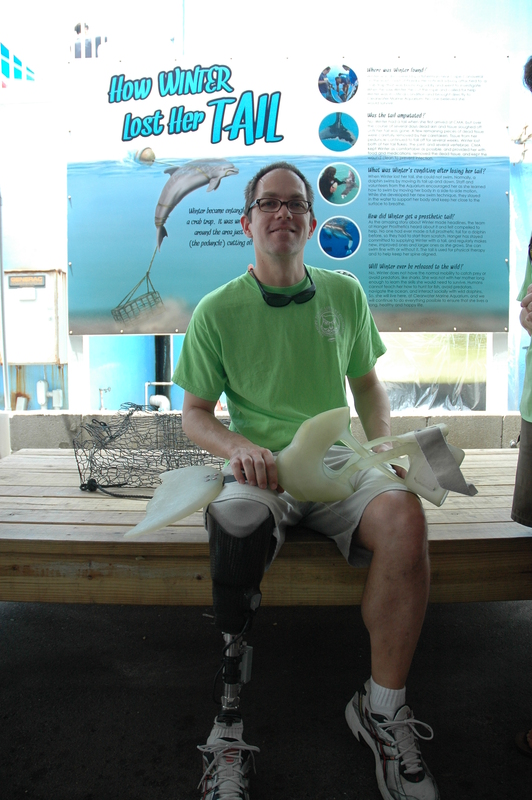 The movie features Winter, the prosthesis wearing dolphin, and the sequel features Bethany Hamilton. Hamilton, who plays herself, lost her arm in a shark attack while surfing her home waters of Hawaii. Cheryl said the movie was good, but Hamilton didn’t have a lot of dialogue. The first movie is based on the children’s book, Winter’s Tail. I enjoyed the movie Dolphin Tale so much, my wife Susan and I went to Clearwater, Florida to see Winter. The picture of me with Winter’s prosthesis number 17 sits on Susan’s desk at Daphne East Elementary School. Her kids don’t even notice my prosthesis because they are so excited about seeing Winter’s prosthesis. I always straighten the new books when I walk past them on the way to my desk. I spotted Stronger, a book by Jeff Bauman and Bret Witter. Bauman survived the Boston Marathon bombing, losing both his legs, but was an FBI witness in the search for the bombers. Killing Jesus: A History by Bill O’Reilly and Martin Dugard. Julius Caesar, after conquering a town along the Dordogne River, cut off the hands of every man who fought against him. I watched the tail end of Utopia on Fox, and a little bit of New Girl. I saw a commercial for Red Band Society, a hospital ward of teens facing long term stays for various illnesses, which now includes leg amputees Jordi and Leo. Susan and I were watching Survivor when we saw a commericial for Criminal Minds. The preview showed a human leg in a box. Presumably, the rest of the show was about finding the rest of body. Looking for movies to borrow, I spotted The Fault in our Stars DVD while scaning the online catalog crawl. I’ve already seen it. Good thing, since it already had 35 hold requests for patrons wanting to borrow it. Yesterday, I saw the future of legs in libraries, which indicates to me that media coverage of amputees and their prostheses will continue to expand. 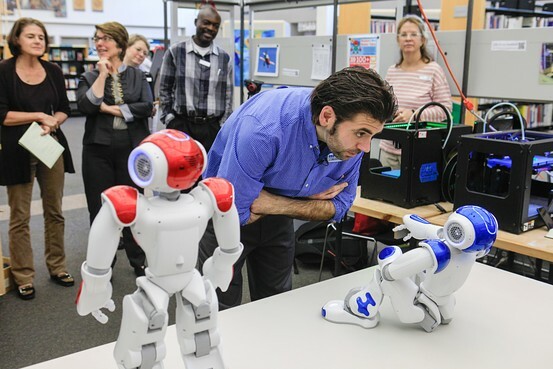 I read in the Wall Street Journal that the Westport, Connecticut Public Library will have a couple of humanoid robots roaming around. Vincent and Nancy are quite sophisticated. They are able to be programmed and also learn with Artificial Intelligence (AI) through human interaction. They have already been programmed to speak 19 languages, to kick a ball, dance, and do Tai Chi. Robots and their artificial intelligence can think on their feet just like humans. Nancy, Vincent, and I do this on our artificial legs. This entry was posted in amputee, amputees, library, public library and tagged Dolphin Tale, Dropkick Murphys, Jeff Bauman, Leg Lamp, leo bonten, Lucca, Red Band Society, robots, Survivor, Vincent and Nancy, wooden leg by asamryfhpl. Bookmark the permalink. I regularly come across strange references to monopods (without looking for them), it happens so often and in so many sodding ways I just now am barely fazed. I was once working on a “zine” I used to do, which included an article in each one about the synchronicities that happened during the making of each one, including lots of amputees in mythology or other areas. I was researching something for an article I was writing on dozens of one footed or one sided deities or fairy type creatures in cultures from around the world (many, if not most, I happened upon serendipitously), and was interested in the Ancient Mayan god Hurakan (god of wind and storms, where we get the word hurricane) who was one-footed. It turned out his name also was used for the fly agaric mushroom,a maintain music aria – the (in)famous red capped with white dots psychedelic ‘shroom, which was (likely still is) used ritually in Central America. I got out a map outline of the world and shaded in the parts of the world that seemed to have the most myths or central myths about monopods and sciapods and such – Central and parts of North America, Siberia, South West China, parts of India, Greece, Ireland, etc. I then got a book I had on shamanic use of psychedelics, and looked at their map for locations amanita is known to have grown. It was a perfect match – except for Ireland. That bothered me, as Ireland had a lot of one-legged fairies, amputee shaman figures, and stories that fit the theory they were connected so well. I put it in the back of my head, taking a break from the zine to go on a family vacation to New Orleans for my nephew’s birthday. We just went for the day. The first stop was the aquarium. While walking thru the acrylic tunnel surrounded by sea life, a large tortoise swam by, with only three fins! I didn’t expect to see any missing limbed creatures in an aquarium, as most of the inhabitants are fish who don’t have limbs per se. I joked to my family to let me know if any more missing footed creatures popped up. We then went to the next floor, where I learned quite dramatically the aquarium also serves as a place to nurse wounded birds back to health. I turn a corner and there about seven feet away is a perch with a crow standing on it (I’ve always loved crows and ravens). I notice right away it has only one leg! Even more peculiar, the crow seemed to notice me, and that I had one leg. It had been very aloof, squeaking at anyone who got near it, but as soon as it seemed to register me, it flew to the floor, and hopped over to me. I’m standing there in amazement, the crow keeps shaking its wings and squeaking at anyone else who walks nearby, and he just stands right by my foot staring at me as I stared at it. Birds of a feather hop together, I guess. People walking by looked like they assumed it was a show with a trained bird, very spooky. I finally said goodbye to the crow of one leg after several minutes and we neared the exit. Once again, I joked to my family that if any more missing limbed animals show up I might lose it (not expecting any more). Just as we left, a man walked his dog right by us in the park the aquarium emptied into. The dog had a strange gait. As it passed, I saw it had only three legs. Had we left the aquarium a couple of minutes later, we would have missed it. But that is not all. Before we left home, we stopped in Metarie at a strange bookstore someone told us about. They had a bunch of off-beat magazines, counter-culture type stuff and other oddities that one just can’t find around Tuscaloosa, AL. We did not have much time, so I grabbed a few mags that had interesting titles and quickly looked at the books. When I got home, the next day I was glancing through the magazines to see what was in them. One was about psychedelics (btw, I read about them a lot, never used any), and as I’m casually flipping through it, I see this page with incredible artwork – a whole page of the European “monster” type the “sciapods” (shadow foot – one legged people with a foot so large they would lie (lay?) on their back and use the giant foot as an umbrella for shade – they also look a lot like mushrooms in that position). The artwork was for an article that was an excerpt from a new book, by Peter Lamborn Wilson – I believe the title is Ploughing the Fields of Heaven : the Search for Irish Soma. It was by an expert (well known in some fields) all about how the ancient Irish people probably used amanita muscaria during ceremonies and rituals. Exactly the missing piece from the article I was needing! Thanks to the “Library Angel” as some writers refer to such coincidences, I found the one book I needed to finish my article. So take it from me, be careful looking for one-legged coincidences, they can get pretty wild! “a maintain music aria” was not madness setting in (can’t vouch for the rest of what I wrote), it was spell check acting without my notice on the words “amanita muscaria.” Magic mushroom, which I suppose could subjectively maintain a music aria.